Surrounded by all my artworks in the studio I had in Mossel Bay. As I am busy with a pencil painting, very much like this little one here, I decided to do a blog post about all (or some of) the pencil artworks I did. 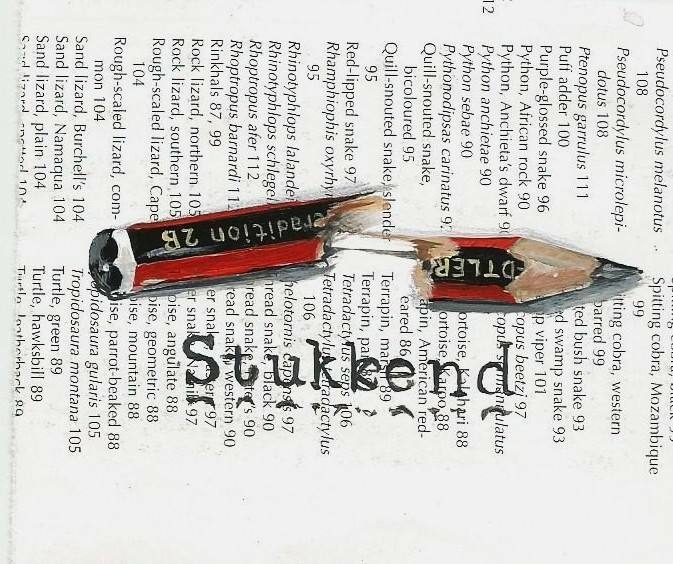 This is where the first pencil started, almost 4 years ago, a miniature little painting for an art exhibition at Longstreet Art Lovers Gallery in Waterkloof Pretoria. I go through phases where I get caught up in a specific theme and it seems impossible to get away from that theme, it is like there are images bundled up in me and I cannot stop before each one of them are “exposed”. As sudden as a theme emerges, it seems to disappear, I am drained from them and I have to move on. From time to time I might visit such an image again but there are just too many themes and images in my head, impatiently waiting to be explored, therefore I cannot stick with anything for too long. A pencil as conversation piece. This is my first 3D pencil I made with the help of Willi, and it was bought by a “girl with go”. 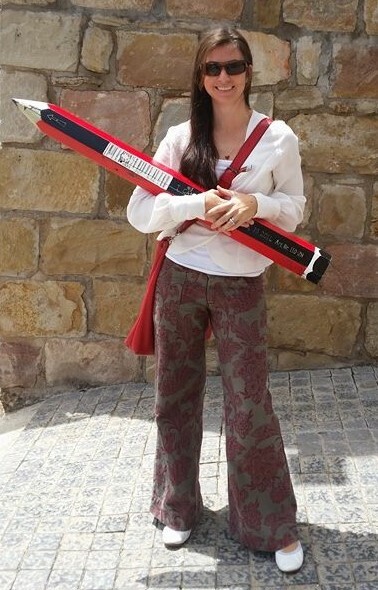 Lynette has a very successful marketing company in Mosselbay, Grindstone Advertising Agency and as her approach to business is very playful, bold and striking, this pencil was the perfect conversation piece for her office! “Draw the line” exhibition with art teacher, Darrel Otto, and my daughter and her friends. 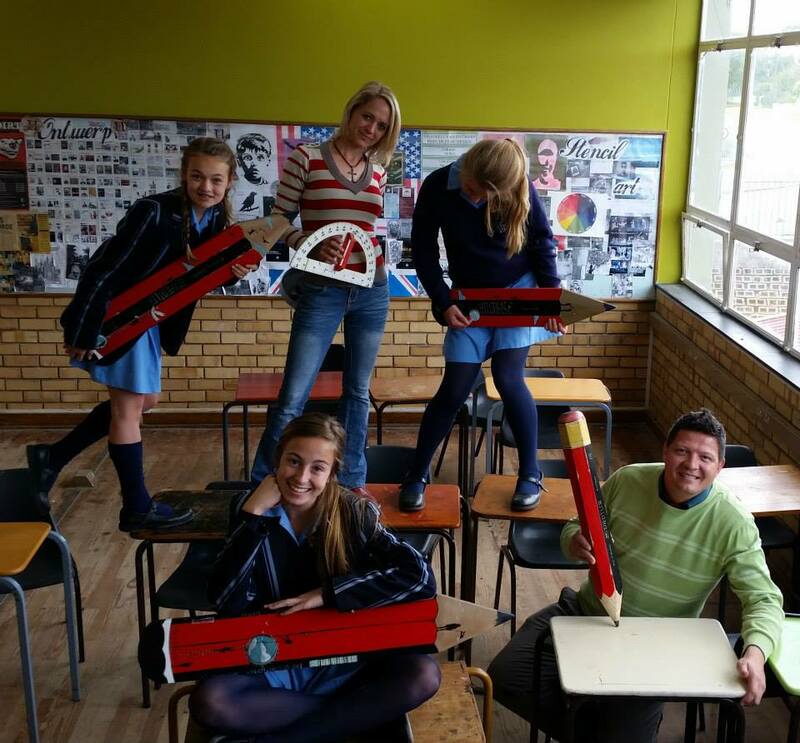 Learners At Punt Highschool in Mossel Bay. The “Draw the Line” art exhibition inspired me to go big with the pencil theme, and the pencils kept on growing more and bigger by the day. This was great fun!!! Luckily I had capable friends while I had my gallery in Mossel Bay. Dawie Horn , the good hearted man, was always just a call away. Dawie did some of my pencils and helped with assembling and sourcing everything else. 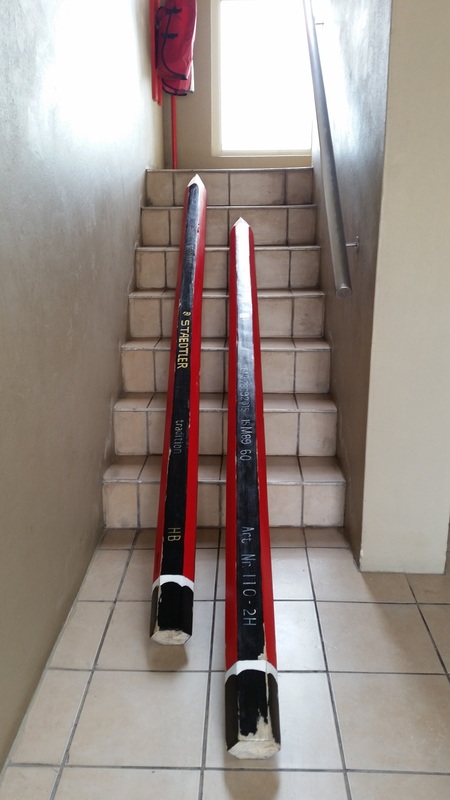 I was not allowed to have signage boards on the outside of my gallery as it was in a historic building and Dawie made me a giant pencil just to have something on the outside to catch the eye. The Searles Manor building was build in 1902 and is a magic space and ideal for an art studio, in this studio, my art expanded!! Dawie hard at work, making huge pencils for me. 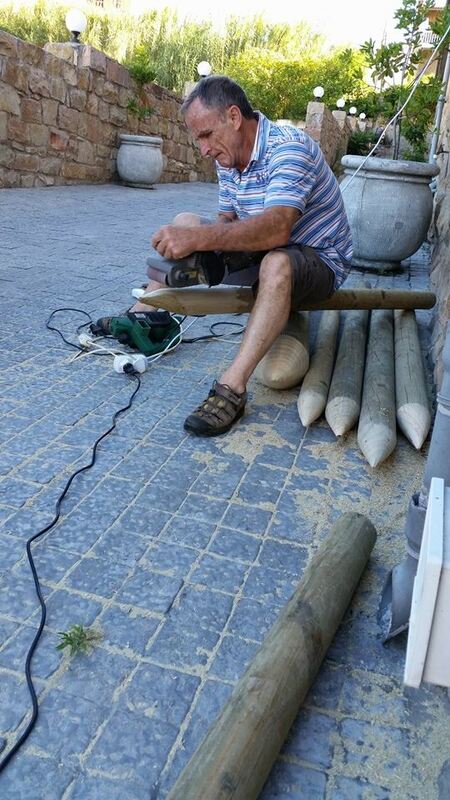 Willi is an artist as much as a handy-man and was able to help with all shapes and sizes. Willi, my Mossel Bay friend who used to make my shaped pencils for me. And here is the outcome of the two pencils towering above Willi . These two pencils were commissioned by a client. Painted pencils as decor items. I ended up painting stories on flat wooden pencils and got commissions from clients to do symbolic paintings, depicting their stories in these paintings. Funky girly pencil and a white dove. 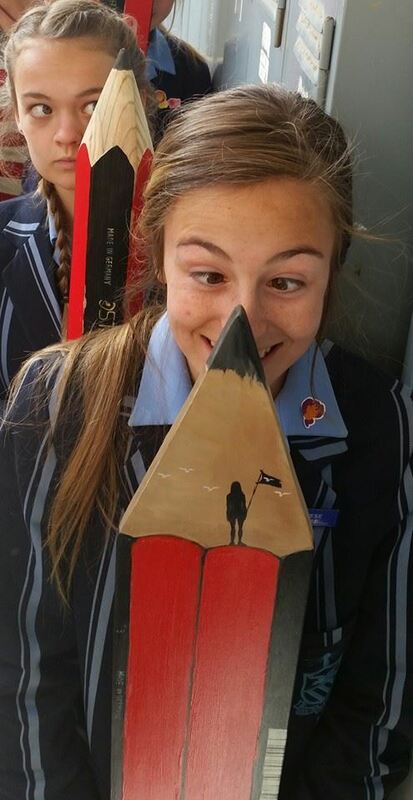 Posted in Blog and tagged Mariaan Kotze, Acrylic Painting, Art Studio, Pencils, Art Exhibition, artist, Decor, Broken, best pencils, pencils as decor, conversation piece for office, art teacher, Highschool Punt, Mossel Bay, Searles Manor Building, classroom. Baie dankie Deon. Ek waardeer jou feedback.